LONDON -- There are many reasons to visit Harrods. It is arguably the most famous store in the world. British signs that tell you where the "wet fish" are to be had. Bagpipers wearing the Harrods tartan walk through the store on a regular basis piping everything from "Amazing Grace" to Beatles tunes. 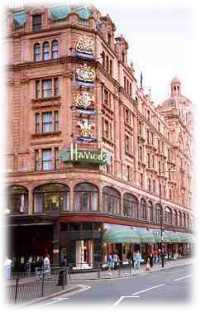 Harrods is, in fact, one of the most popular tourist sites in England, ranking right up there with St. Paul's Cathedral, Big Ben and the Tower of London. Huge numbers of tourists go there just to gawk. I went there to use the loo. Finding a loo (we call them washrooms in America) is one of the biggest problems for a tourist today. Some cities do have public washrooms, but many tourists do not want to use them fearing crime or a lack of cleanliness. This leaves private establishments. If you eat at a restaurant, you can use their facilities, but what if it is not breakfast, lunch or dinner time or you don't want to buy a whole meal just to go potty? The department store has long been an oasis. Large department stores provide clean, safe places for the needy shopper or tourist. It is one of those things most people have come to depend on. And so after a day of walking around London doing all the cultural things you are supposed to do, I came out of the Victoria and Albert Museum, which is a nice walk from Harrods. So I ambled over to window-shop and use the loo. I asked the attendant just inside one of the 14 entrances where I could find one, and he instantly directed me to the "men's luxury washroom." I walked up, and a man was seated on a chair outside. "Afternoon," he said. "Are you a Harrods account holder?" You mean, do I have a Harrods credit card? I asked. Naw, I don't live here. "In that case, it will be a pound," he said. "To use the washroom," he said. "One pound." Since one pound equals about $1.65, I did what any sane person would do: I decided to hold it in. I later discovered that there were exceptions to the pound-to-pee rule: pregnant women, small children, people who have purchased 100 pounds (or about $165) worth of goods or Harrods credit card holders. As I turned away from the washroom, I noticed the guy behind me had a receipt in his hand. Did you spend a hundred pounds just to use the washroom? I asked. "Naw," he said. "If you get a meal in one of the restaurants, they have to let you use the johns. But I was told it has to be a real meal, not just a Coke or something." And he showed me his receipt. It was for a pizza and a Coke in the Harrods pizzeria. I did the math, and it totaled $21.12. That's a lot of money to answer a call of nature, I said. "Hey," he said, stepping around me and handing the guard his receipt, "when you gotta go, you gotta go." Which you can't argue with. So I went and found the cheapest restaurant in Harrods -- in order to eat at the sushi bar, I would have had to cash in my return-trip airline ticket -- and ordered the cheapest thing I could find: a toasted ham and cheese sandwich. The bill came to $14.03. But when I paid it, the waitress handed me a receipt that said at the bottom: "PLEASE RETAIN THIS RECEIPT FOR COMPLIMENTARY USE OF OUR LUXURY WASHROOM FACILITIES." I was going to argue that if something costs $14.03, it is not "complimentary," but instead, I ran off to the loo and presented my receipt to the guy on the chair. "Lovely," he said and took out a little magnetic key card and swiped it through a security device, which made the door unlock. Brilliant, I said and ran inside. And, lo and behold, the inside of the men's luxury washroom looked exactly like ... a washroom. True, the floors were made of gray and salmon marble, and true, you could make the toilet flush and the water come on in the sink by passing your hand over an infrared sensor, but is that worth $14.03? I don't think so. I really think that unsuspecting tourists should be warned. Millions of them visit Harrods each year, and they get a rude awakening when they try to go to the bathroom. Which is why when you land at Heathrow, there ought to be big signs that say: "You are now entering England. We hope you went before you left the house." 5/28/98Buba is back from Europe ... but what did he accomplish? 5/12/98:Just who is "Mr. Republican" these days?"